We had several requests to do this conversion so here it is – ? pieces in stock ( please ask they go out as fast as they come in ). The conversion of his request and took off the sword hands and replaced them with mercedes hands so I cannot sell it as “new” call it mint. Other people have requested this change but the look is too close to the R*lex And our objective is not to copy that or any other brands – it is a watch that bears similarities to the 5513 but, that stands on its own. This is the WCT Precision Diver. 25 jewel Swiss movement and 200 meter depth pressure tested. There has been a need for a new watch among people who cannot or will not pay the price of certain excellent but, very expensive watch companies like R*lex and others – they offer wonderful timepieces but, the prices are not in keeping with everyone’s budget for an EVERYDAY knock around watch which watch sellers, collectors and just people who chat about watches call “beaters”. A beater does not need to be ugly and cheaply made. 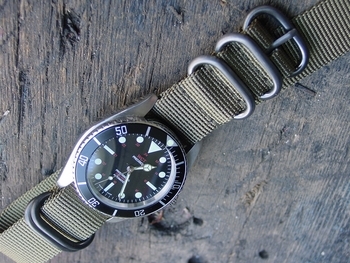 This is such an example of a reasonable priced watch with the looks of a sub in many ways a military like dial with refinement and a classy look that can be worn by a man or a woman – it comes on an oyster steel solid stainless bracelet with adjustable links and clasp with flip lock – yes you can dive with it, it is tested to 200 m water resistant with a SCREW DOWN crown and back. This is also refitted with a domed genuine sapphire CUSTOM ground crystal made for this watch - convex under NOT flat like a cheap crystal. It has a firm uni-directional ratcheting bezel ( not inexpensive friction which slips) . This watch has as its power plant a new ETA 2824-2 automatic self-winding movement which is shockproof and all Swiss made. The is the same movement used by MANY MANY of the worlds’ best watchmakers for their watches for reliability, and ease of repair and parts are always available although unlikely you will ever need to do that. This watch was made for me and in conjunction with the respected Albert Wajs of Switzerland of Ollech and Wajs who have manufactured durable and collectible military watches for over 40 years. This watch cannot be bought elsewhere that is why it has the WCT initials and not the O & W logo although Mr. Wajs was kind enough to allow his company name of PRECISION to appear to show his connection with this project – it is my watch to make people aware of quality at a reasonable price and those who appreciate the look and the dial with its military history and layout. It is 39.5 mm in diameter without the crown and 45 mm lug to lug. Yes the dial markers are Superluminova by Tritec S.A. – for you assurance of good use in dim light situations and night time as are the hands . The price is 385.00 + shipping. refer to item no. WCT-MBZ-ND This carries a 1 (one) year Limited Warranty – if the problem is my fault I fix it if it is yours I do not –cannot be clearer than that – no legal jumblese about water and so on.